Hyacinth bean (lablab bean) is a pole beans cultivar of Fabaceae family of legumes. Lablab bean is probably originated from India, where it is grown in the home-gardens for immature pods, which are eaten as vegetables. 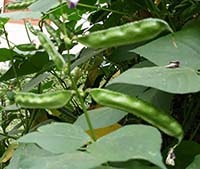 The beans are also enjoyed in Japan as fujimame, in the Middle-East, Central America and Brazil. Botanically, the beans belong to vine (twirling) variety in the Fabaceae family, and the genus: Lablab. They are also recognized by dolichos bean, seim bean (India), Egyptian bean, bonavist bean/pea, dolico lablab, fagiolo indiano, etc. The lablab bean is a variety of annual, dolichos beans. The black-eyed peas and yard-long beans are other close relatives. Hyacinth is a tropical perennial twining plant requires trellis to support its growth. It continues to grow as short-term perennial as long as moisture and weather permits. Purple/white flowers appear in clusters which develop into flat, thick, slightly curved green pods with pointing ends. Each pod normally contains two to six round or oval, light green, cream, black, brown or mottled seeds. The seeds also exhibit prominent white hilum, usually covering one third of the seed. Fresh lablab beans are harvested while unripe and used in the same way as green beans. Dried seeds can be used in the same way as other legumes, which it can replace in many other recipes. Raw, immature hyacinth pods carry just 46 calories per 100 g; whereas, dry mature seeds contain 344 calories. Dry hyacinth beans contain 23.90 g or 44% of recommended daily allowance of protein. Dry lablab beans indeed are very good sources of dietary fiber among pole beans. 100 g dry beans carry 25.6 g or 64% of DV of fiber. Dietary fiber works as a bulk laxative that helps to protect the colon mucosa by decreasing its exposure time to toxic substances as well as by binding to cancer-causing chemicals in the colon. Dietary fiber has shown to reduce blood cholesterol levels by decreasing reabsorption of cholesterol binding bile acids in the colon. Hyacinth beans are gluten-free food products. They often recommended as alternative gluten-free protein food in gluten-allergy and celiac disease patients. Dry hyacinth beans are one of the finest sources of several B-complex vitamins like thiamin, pyridoxine, riboflavin, pantothenic acid, folates, and niacin. Most of these vitamins works as co-factors for the enzymes in carbohydrate, protein and fat metabolism. Dry hyacinth beans hold 1.130 mg of thiamin (94% of DV). Thiamin chiefly involeved in the carbohydrates metabolism. Its deficiency may leads to beri-beri disease. 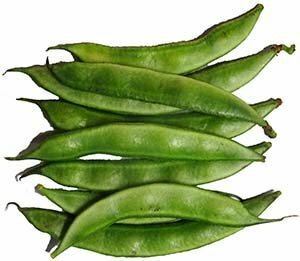 Fresh, immature pods carry very good levels of vitamin-A, and K. 100 g of fresh pods carry 864 IU (29% of DV) of vitamin-A. Vitamin A is a powerful antioxidant which helps in mucosal regeneration and maintenance. Fresh pods are also excellent sources of vitamin-C. 100 g gresh pods contain 12.6 mg (21% of DV). Vitamin C is a powerful water-soluble antioxidant and helps in wound healing, and tissue repair. Dry lablab beans are an excellent sources of minerals. 100 g of dry beans hold copper-148% calcium-13%, iron-64%, magnesium-71%, manganese-68%, phosphorus-53% and zinc-84%. 100 g of beans hold 1235 mg or 26% potassium. Potassium is an essential electrolyte of cell and body fluids, which helps to counter pressing effects of sodium on heart and blood pressure. In many Asian households, tender, immature, whole lablab beans most often used in the cooking. Fresh beans can be readily available in the local markets all over topical countries. Choose fresh, tender, immature beans for use as vegetables. Avoid shriveled, broken, cut, bruised beans as they are less appetizing and spoil early. To store, place them in the refrigerators like French beans for extended use. Wash the beans in cold water to remove any surface dirt. Trim the ends and remove any string that comes along easily while pulling off the trim ends. Cut them in equal sections for even cooking. Dry beans are treated like other dry beans. Soak them in cold water for 6-8 hours. Soaking and boiling also helps eliminate anti-nutritional compounds and reduce flatulence. Fresh beans used in stir-fries, stews; and baked, in salads. In India, hyacinth beans are called as seim beans. Tender beans commonly used in sem-aloo ki sabzi with potato, onion and tomato. Che dau van is a favorite Vietnamese bean dessert prepared with boiled hyacinth beans, sugar and coconut milk. Whole immature pods popular as Chapparada avare kayi (trellising lablab pole bean) in Kannada (South India), the beans used in the delicious curry preparation served with rice. Hyacinth beans should only be consumed after thorough cooking. Raw beans contain cyanogenic glycosides which can cause release of cyanide gas and toxicity. Cooking eliminates toxic substances and makes them safe for consumption. (Medical disclaimer). <<-Back to Legumes from Hyacinth bean. Visit here for an impressive list of vegetables with complete illustrations of their nutrition facts and health benefits. Mature seeds-USDA National Nutrient Database. Raw, immature pods-USDA National Nutrient Database.